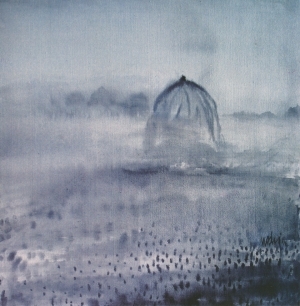 At present, Nasim Ahmed Nadvi is working in black and white unlike his earlier works that were characterised by colour. “My work definitely focuses on nature," says the artist. Man comes from nature and ultimately goes back to nature. His best comfort, as the German philosopher, Friedrich Nietzsche, put it, will always, and finally be nature. Sometimes he compromises with nature. Sometimes he forgets it. I believe that what a man sees in the first ten years of life is what remains in his mind and influences his creation and creative urge. Nadvi says he was deeply influenced by his paternal uncles Dr Noazish Ahmed and his brother Naimuddin, who became famous for their black and white photography in the forties and fiftees. "Their powerful work was taken from Nature" explains Nadvi. "Dr Noazish, I believe, tried to see nature through his own eyes. Dr Noazish's study was microscopic. He worked against the light. I believe that everything, seen against the light is different. Naimuddin might have painted a door. Dr Noazish's photograph will have presented the same subject with a microscopic, close-up shot. Coming down to the art world, Mohammed Kibria is called an abstract painter. In reality, he was a supreme realist. He might have taken a bark of a tree and dwelt on it in detail. Thus, the simplification that ensued, we take as an abstract creation. Kibria would take a section of a metal vessel and elaborate on it, in the same manner. I believe that everything is within the boundaries of nature. In order to understand Kibria, one must admire his close observation of nature. The same applies to Dr Noazish Ahmed's photographs. "The individual who has most influenced my work, as in the case of many artists, is my mother" he adds. "She is the person who has made me what I am. Next, my influences include Rabindranath Tagore and Lalon. If one asks me which song I like best, I cannot give a definite or satisfactory answer. It all depends on my mood. Musing 19, acrylic on canvas, 2001. During his student days, people wondered at Nadvi's use of a riot of colours. Today, at 60, he prefers to work in black and white. With colours, one can impress one very quickly. With black and white you need an intellectual level and experience, says Nadvi. In China, at one time, an artist was not allowed to work in black and white, until one reached a level of maturity. If one is told to write a story, he'll manage it somehow. If he is told to write a poem it's very difficult, says Nadvi. The recently deceased master artist, Aminul Islam, guided Nadvi when he was a student in 1969. The political atmosphere was very volatile. Everybody was in a rebellious mood. 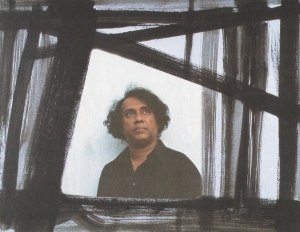 Aminul Islam worked on black and white, in design-based work. The artists of his time, had broken away from the Bengal School of Artists, and were westward-looking, with contemporary Florence and Venice in mind. Zainul Abedin and Aminul Islam were great friends; but philosophically there was a difference. As a consequence, they kept their ideology apart. Aminul Islam began his work in black and white, says Nadvi. The pictures he'd seen as a child, of Dr. Noazish and Naimuddin, influenced him. Aminul Islam taught him how to paint pictures in black and white. Films and photography, says Nadvi, which have been well-loved through the years, are still those in black and white. Within the black and white, says Nadvi, you can imagine the colours you like. If the artist applies colours, the imagination gets restricted and cannot flow free. Dr Noazish Ahmed worked in colour, later on, in his life. He tried to combine photography with a painter's view. 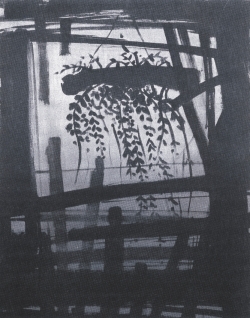 Nadvi believes that Dr.Noazish wanted to blend photography with a painter's view. The great photographer combined his wisdom with artistry. Black and white is appreciated the world over. He says that he is an impressionist, who wants to depict his feelings through his paintings. This is whether he portrays the falling of rain, the rise of the sun, a moonlit night or a field of “kashphul”, seen at different seasons and at different angles. He doesn't use living beings or human figures. Some people are of the opinion that those elements are essential. But Nadvi doesn't feel that way.” Nature itself has its own life,” says Nadvi. Nature holding its breath before the storm or a clouded sky has a life of its own which deserves minute observation and careful delineation says Nadvi. Nadvi has worked mostly with nature, living in Paril Nodha, 35 kilometres from Dhaka, with a steady, rich cultural life of its own. It was here that, famous singers, painters, actors met and spent time, and exchanged views, in a relaxed atmosphere---away from the noisy, humdrum life of the suffocating metropolis. With hills, trees, rivers and birds the leisure hours spent here by well-known cultural personalities like Sanjeeda Khatun, Fahmida Khatun (singers)and Qayyum Chowdhury, Mahmudul Haque, Mustafa Manwar (painters), poet Shamsur Rahman and Emdad Hussain ( artist Nisar Hussain's father) enjoyed each 25th of December. This was organised by Dr Noazish Ahmed before 2009, when he passed away. Nadvi kept up this tradition by ensuring that the right people were invited. This began with “pithas” with the juice of “ khejur” (dates). After repartee and lunch, there was a regular cultural show, says Nadvi. Hence, Nadvi grew up against a rich cultural backdrop of music, poetry-recitation, singing and what have you. Married to artist Naima Haque, the daughter of a structural and agricultural engineer Professor S.M. Najmul Haque, it was only natural that their home would be artistically designed. The design of their house has the artist Mondrian in mind. Mondrians' love of squares and rectangles are well-known. Nadvi himself studied architecture, and there are five to six houses in Dhaka designed by Nadvi. They follow Professor Najmul; Haque's certain aims such as low cost housing, with plenty of light, air and green plants, trees and creepers around, were kept in mind in Nadvi's own unique house, with its poetic ambiance. He says he blends Aminul Islam and Professor SM Najmul's concepts in his architectural endeavours. Thus architecture is one of this jovial and soft-spoken artist's other interest, like singing, in which he revels.